Does Diet Play a Role in Intestinal Bowel Disease? Author SimaPublished on August 14, 2018 August 14, 2018 Leave a comment on Does Diet Play a Role in Intestinal Bowel Disease? Two recent studies caught my eye – both reviews of scientific research that looked at the issue of diet and whether it contributes to the development of Intestinal Bowel Disease (IBD), specifically Crohn’s disease and ulcerative colitis. These are chronic inflammatory disorders of the gastrointestinal tract, and which are rapidly increasing in developed countries (over 1 million individuals in the US). The main question is: Does a person’s diet contribute to the development of IBD? Both articles (one in the journal Nature Reviews and one in Immunology) said: YES, there is growing evidence that a person’s diet has a role in the development of IBD. Both articles stated that the current view is that some individuals may be genetically susceptible, and their diet (which feeds the microbes in the gut) then makes them more prone to the disease due to the mucosal lining becoming permeable and inflamed. Studies have shown that people with IBD have gut microbial communities that are imbalanced or out of whack (dysbiosis). What does this mean? A person’s diet has a key role in what microbes live in the gut (human gut microbiome) – what one eats feeds the microbes in the gut, and a person’s general dietary pattern feeds some types of microbes and not others. So what one eats determines what lives in the gut microbial community. Unfortunately a fiber-deficient diet (typical Western diet) is both linked to increased mucosal inflammation (the mucus layer of the intestines) and it makes it leaky. In other words, a fiber deficient diet impairs the mucus layer of the intestines. Animal studies also support this (that the diet regulates mucosal barrier function). People in developed countries such as the US typically eat a Western style diet. A Western diet is characterized by high amounts of red meat, processed food, high-fat foods, refined grains, sugary desserts, and low intakes of dietary fiber. However, the Western style diet has been linked to increased mucosal inflammation of the intestines, and to a higher incidence of a number of diseases, including ulcerative colitis and Crohn’s disease. What diet is best? A diet rich in fruits and vegetables, whole grains, nuts, seeds, legumes (beans), and fish. Low in red meat, but moderate amounts of poultry. High in vitamin D, and high in omega-3 fatty acids. High in dietary potassium and zinc. Eat the foods, not supplements. One good example to follow is the Mediterranean diet. Think of it this way: high fiber diets lower inflammation in the gut, low fiber diets increase inflammation. 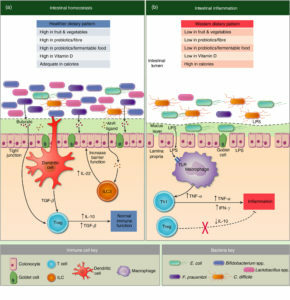 Both articles had similar diagrams showing that diet has an effect on the microbes in the gut (the microbiome), which results in either 1) a healthy mucosal lining of the intestines, or 2) a disturbed mucosal lining, disturbed permeability, and inflammation. The one article calls it the “mucinous layer” and the other calls it the gut “barrier” in the diagrams, but both are talking about the mucosal lining of the intestines. Next article:Is Glyphosate In Oat Cereals A Concern?